Every year, thousands of people across the country are injured in car accidents with semi-trucks. In 2014, famed comedian and actor Tracy Morgan was severely injured, and his friend was killed, when a semi-truck rear-ended the limousine they were passengers in. The truck driver stated that he had been awake for more than 28 hours straight when his semi-truck rear-ended the limousine. The truck driver told officials that he had spent 12 hours driving his own vehicle from his home in Georgia to pick up his semi-truck in at a Walmart facility in Delaware. A spokesperson for Walmart stated that the company did not believe the semi-truck driver violated any federal safety regulations. The semi-truck driver later pled guilty to vehicular homicide and four counts of aggravated assault. The estate of the friend that was killed, James “Jimmy Mack” McNair, received a $10 million settlement with Walmart. Tracy Morgan also received an undisclosed amount in a settlement with Walmart. In September 2017, a woman was killed in Washington State when a semi-truck attempted to shift lanes and rear-ended a car. The car that was rear-ended then spun around and hit another car. Three additional people were injured in the crash. 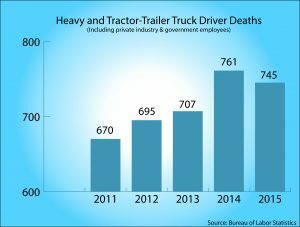 Fatalities resulting from accidents with semi-trucks have steadily risen in the past five years. The fatality rate for crashes involving semi-trucks increased 17 percent from 2009 to 2013. According to the Insurance Institute for Highway Safety, 3,986 people died as a result of car accidents with semi-trucks in 2016. 17 percent of those fatalities were occupants of semi-trucks, 66 percent were occupants of cars, and 16 percent were pedestrians. According to trucks.com, semi-truck driver fatalities have also risen over 11 percent over the past five years. The leading causes for semi-truck accidents include driver fatigue, loss of control after a tire-blowout, traveling too fast for conditions, and lane drifting. To combat driver fatigue, federal law mandates that semi-truck drivers are limited to driving 70 hours per week and may only “restart” a new workweek after a mandatory 34 hour rest. Additionally, drivers are limited to driving a maximum of 11 hours per day and must take a 30 minute break during that work period. A 2015 study by the Federal Motor Carrier Safety Administration revealed the average time spent sleeping nightly by a semi-truck driver was around 6.48 hours. The study found that drivers who were in need of sleep when they took a restart were more fatigued, sleepier, and less alert while driving. Evidence collected showed that a majority of drivers were consistently fatigued by the time they took their restarts. Drivers who incurred additional sleep time before a restart of a workweek decreased their overall fatigue and sleep time while working. Regardless of the federal regulations placed on semi-truck drivers to combat driver fatigue, drivers still face the pressures to keep their employers happy and increase productivity. Truck-driver employers, namely the shipping companies, put constant pressure on truck-drivers to deliver their cargo by a certain time. Even though the trucking industry knows of the dangers associated with fatigued driving, it opposes any safety rule changes to combat fatigued driving. The trucking industry maintains that any rule changes will increase costs associated with transporting goods and will raise rates for shippers and consumers. 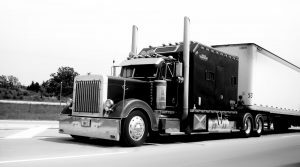 For more information about truck accidents, visit our page HERE. Being involved in an accident with a semi-truck can be dangerous and scary. Injuries and the costs of treating those injuries can easily add up. If you or a loved one has been injured by a semi-truck driver, contact car accident attorney John Malm at John J. Malm & Associates to learn more about how you may be entitled to receive compensation for your injuries.